Go to original pattern for design DROPS 111-9. DROPS slippers in moss st in 2 threads ”Fabel”, worked in squares. 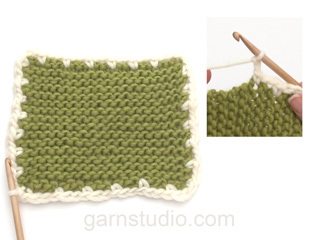 DROPS POINTED NEEDLES size 4.5 mm – or size needed to get 18 sts x 34 rows in moss st with 2 threads Fabel = 10 x 10 cm. 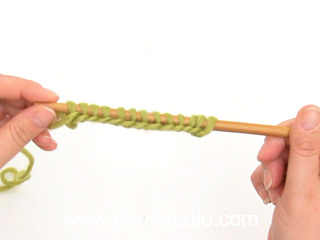 DROPS CROCHET HOOK size 3.5 mm – for border. 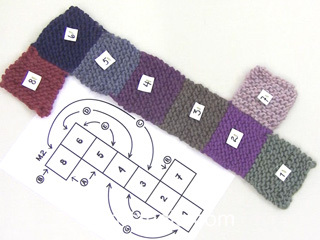 MEASUREMENT TIP: It is important to adhere to the knitting tension in order the squares become quadratic. The diagonal of 1 square x 2 equals the foot length of the slipper. Row 1: * K1, P1 *, repeat from *-*. Row 2: K over P and P over K.
ASSEMBLY: See Fig.1. 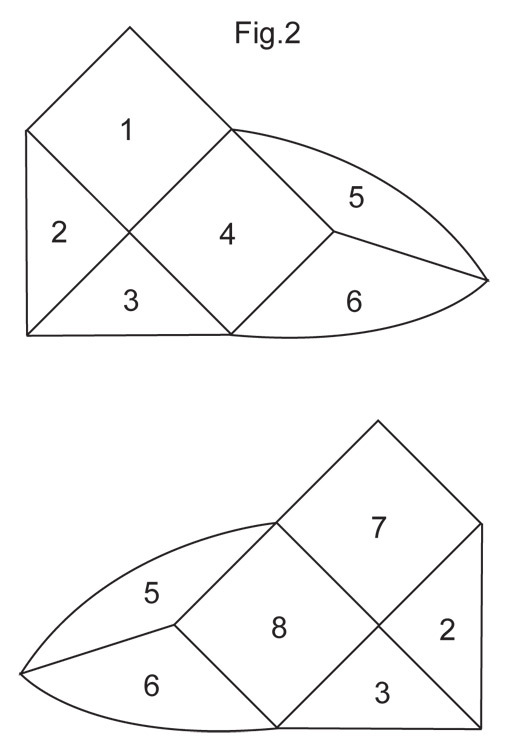 Fig.2 shows how the squares are placed after assembly. 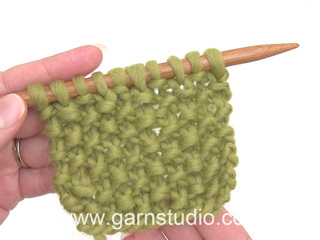 SLIPPER: Worked back and forth on needle in squares (mark the squares as you go along). Cast on 15-16-18 sts on needle size 4.5 mm with 2 threads Fabel. SEE MEASUREMENT TIP! Work MOSS ST – see above – for 8-9-10 cm (= square 1). * Insert a marker in piece and work moss st for 8-9-10 cm * (= square 2). Repeat from *-* until there are 6 squares, piece now measures approx 48-54-60 cm, cast off. Now pick up 15-16-18 sts on the right side of square-2 (= square-7, see fig-1). Work 8-9-10 cm moss st, cast off. 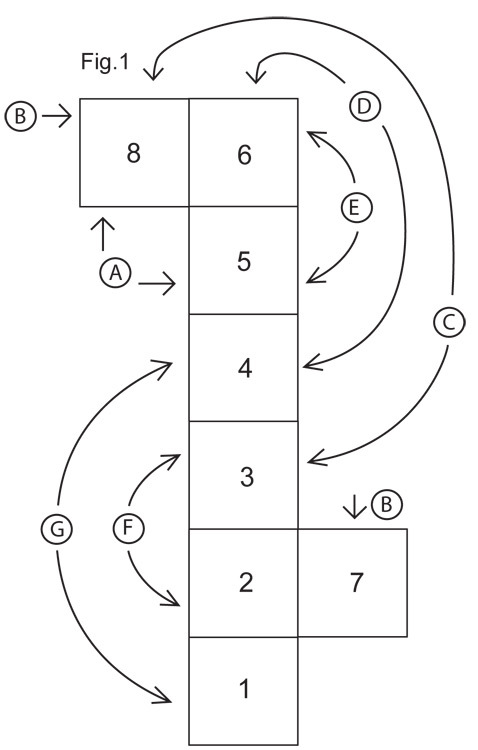 Pick up 15-16-18 sts on the left side of square-6 (= square-8, see fig.1) and work 8-9-10 cm moss st, cast off. ASSEMBLY: Fold slipper and sew tog in outer loops of sts to form a neat seam, as shown in Fig.1 and Fig.2. CROCHET BORDER: Crochet a border round the opening of slipper with 2 threads Fabel and crochet hook size 3.5 mm as follows, beg mid back: 1 dc, * 1 ch, skip 1 st, 1 dc in next st *, repeat from *-*, and finish with 1 ch and 1 sl st in first dc. Bella questa variante delle pantofole court jester! il prossimo paio sarà così. Grazie! Bonjour Rota, pour assembler les chaussons, il faut vous repérer à l'aide des marqueurs délimitant chaque carré et des flèches indiquées ci-dessous. Faites chaque couture l'une après l'autre, comme indiqué. Bonnes finitions ! En daar zag ik plotseling het patroon bij de sloffen staan. Ik ben er heel blij mee en ga direct beginnen. Bedankt!! Vill gärna ha mönstret till dessa sockar ! Zou ook heel graag dit patroon toegestuurd krijgen. ziet er prachtig uit.